I read this article and found it very interesting, thought it might be something for you. The article is called Queen of the Ring: Becky Lynch Interview and is located at https://www.totallydublin.ie/more/features-more/queen-of-the-ring-becky-lynch-interview/. Speaking to Rebecca Quin, it’s clear that for all the accusations that professional wrestling isn’t a real sport, it’s definitely hard work. Officially billing itself as sports-entertainment, World Wrestling Entertainment is certainly more theatre than traditional sport, but it’s no less athletic for the distinction. Rebecca wrestles under her ring name, Becky Lynch, as part of WWE’s Diva championship, after moving up from the NXT developmental championship for new talent. Hailing from Baldoyle, Rebecca is one of very few Irish to make it in the WWE scene, and she’s keen to talk about where her interest in wrestling came from and how she finally made it. The Becky Lynch character has long orange-red hair, and dresses in a long leather coat with steampunk welding goggles perched on her head. Though she looks more like she could have stepped out of a Final Fantasy game, her nickname “Lass Kicker” is usually emblazoned in a tartan typeface – possibly due to an American confusion of all things Irish and Scottish. Rebecca is very aware of playing up the ‘fighting Irish’ stereotype, and how it can work to her advantage with different audiences. The Becky Lynch character does seem to have grabbed fans’ imaginations, and Rebecca’s Twitter and Instagram feeds are full of reposts of fan art she’s been sent. They range, as you might expect, from excellent likenesses to scrawled children’s drawings of their hero. But they also include manga versions, a clay model and I spotted My Little Pony and The Grinch cross-over drawings – My Little Becky and How the Lynch Stole Christmas, maybe? Add to this the constant pictures of cosplayers dressed as her, and the explosion of Becky Lynch costumes at Hallowe’en, and all this attention on her image could be daunting. WWE, obviously, isn’t devoid of gender and sexuality problems, and the issue of the sexualisation of the female performers is one that’s linked to the costumes and fan art. There are also accusations that female wrestlers are often used for storyline purposes as reasons for the men to fight each other, and rarely the other way around. Openly gay, lesbian or bisexual pro wrestlers appear to be a rarity, and the storylines have remained heteronormative, although WWE was praised for its vocal support of Darren Young after he came out. 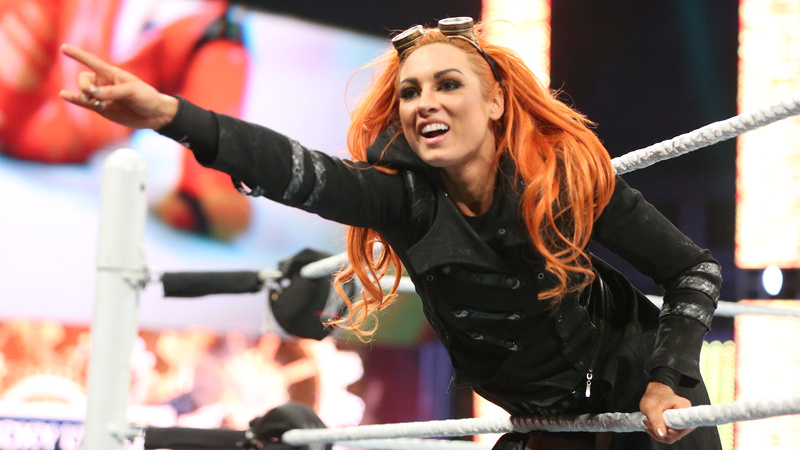 Rebecca will be returning to Ireland and taking to the ring as Becky Lynch in WrestleMania Revenge in Belfast’s SSE Arena on Wednesday 20th April and Dublin’s 3Arena on Thursday 21st April.